German sculptor. After an apprenticeship in the Paprotzan ironworks, he went to the Royal Smelting Works in Gleiwitz, where he learnt how to sculpt and engrave plaques and statuettes by means of iron-casting. After further training in the Brieg-Liegnitz iron foundry, he went to Berlin in 1822, studying at the Akademie der Knste and working at the Royal Iron Foundry under Leonhard Posch. From 1825 to 1840 Kiss worked with the sculptor Christian Daniel Rauch; his first undertaking in Rauchs studio was to produce iron casts of scaled-down, mass-produced replicas after Rauchs famous statues of generals. Kiss also assisted Friedrich Tieck with the work for his monumental Horse Tamers for the roof of Karl Friedrich Schinkel s Altes Museum in Berlin. On commission from Schinkel, Kiss completed a series of sculptural works, including the zinc figures for the Neue Wache on Unter den Linden (1842-46; in situ). In 1830 Kiss became tutor in the bronze workshop of the Gewerbeinstitut. In 1837 he was made a member of the Berlin Akademie; and in 1841 he became a professor there. 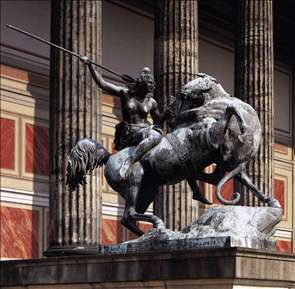 The first major work to make Kiss famous outside his own country was the Mounted Amazon Fighting a Panther for the entrance staircase of the Altes Museum (1837-41; erected 1842). The energy and drama of this group, contrasting strongly with the Classical ideals that had been prevalent, excited the public. Kiss was regarded as the best horse sculptor in Berlin. He further proved his skill in the animal figures for the lively monumental group St George and the Dragon (1855; Berlin, Friedrichshahn), which the already prosperous sculptor donated to the city. In public monuments, for example the bronze replicas of the 18th-century military figures on the Wilhelmsplatz, Berlin, Kiss continued to follow the disciplined style of Rauch, representing his subjects in tranquil poses. Apart from a few tomb monuments and his last work, Faith, Hope, Love (Berlin, Schinkelmuseum), which were in marble, Kiss used iron and bronze almost exclusively. See more details about "Amazon"